We are committed to giving your pet the best level of service possible because your pets are part of our family too. It’s simple — We treat your pets as our own. Perkiomen Animal Hospital has been serving the Upper Perkiomen Valley and surrounding communities for 60 years. Established in 1956 by Robert N. Warner, DVM, Perkiomen Animal Hospital was purchased by Dominick A. Pulice, VMD, in 1989. Our principle focus is in continuing to practice the highest level of medicine you have come to expect. We are an accredited hospital of the American Animal Hospital Association and have been for 25 years. Our goal is to offer exceptional veterinary services, from preventive care to specific medical and surgical needs, with professionalism, knowledge, and compassion. The Philosophy of Perkiomen Animal Hospital’s staff is to provide the highest quality care and service for your pets. 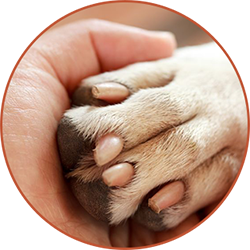 Our goal is to help our clients become better educated on the health and preventative care of their pets. We understand your pet is a big part of the family and we share in your compassion and love for them.